This weak-signal mode can give little pistol stations big gun results. If a quick conversation with someone far away (similar to a contest contact) while running minimal power to a limited antenna is your type of fun, JT9 is worth a try. I’ve always thought that bouncing signals off the ionosphere is next to miraculous in and of itself but JT9 seems to go one better. In the following piece I will explain how you can use JT9 to do an unbelievable job of working very weak stations. Home Owners Association restrictions at my place limit my antenna farm to two W1IS monoband verticals for 40 and 20.1 (I painted them a camouflage-brown color making them nearly invisible from the street.) Still, I get out quite well, but I’ve gotten a lot of experience with CW and PSK. I was introduced to JT9 by Keith Hunt, WC4U. I had heard of JT65 but didn’t know anything about it and I had never even heard of JT9. I did know about Joe Taylor, K1JT, the prime mover behind the JT series of modes, thanks to his Arecibo moonbounce fame and other accomplishments. Joe originally developed the JT series of weak signal communication modes for UHF and VHF moonbounce and meteor scatter transmissions. He has built upon these to develop JT9 for HF and MF. JT9 makes it a pleasure to work very weak, low power stations thousands of miles away. One to 5 W transmitter output works well because each transmission of 13 characters is 50 seconds in length and the computer analyzes the signal according to the complex structure that’s been created by K1JT and other developers. Power is not needed and is not appropriate for this mode. In fact, power levels greater than 20 W can be detrimental and may even cause other stations to be unable to decode the signal. What is required, however, is good time synchronization. Your computer must be accurately synced to an accurate UTC time source. I downloaded the WSJT-X software, the Meinberg NTP timing program to sync my computer’s clock, and a display program called pskreporter. I put these together with my SignaLink USB audio interface and — voila — I was on the air. Figure 1 shows a typical JT9 main dialog; Figure 2 shows the Wide Graph screen where the waterfall is displayed. All the information you need for a JT9 contact is right there. My first contact was with Peter Butler, W1UU. 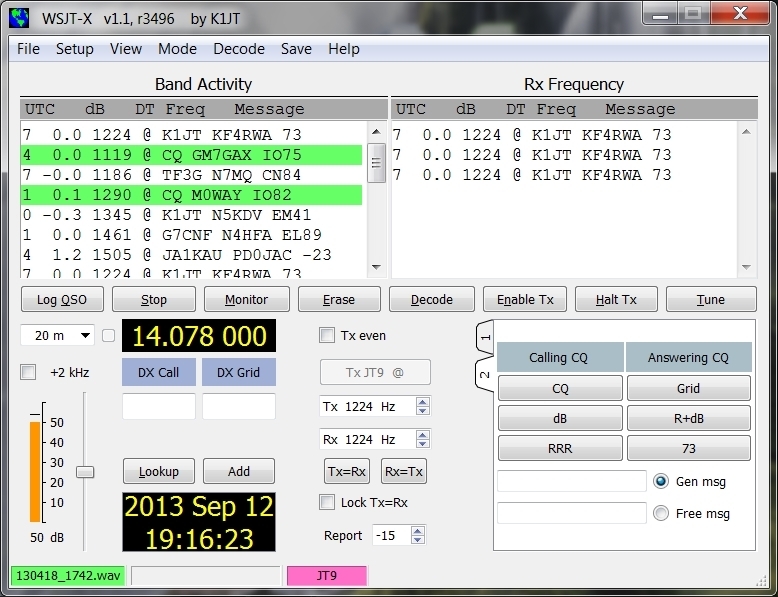 My second contact was Randy Miltier, W6NT, and for my third I answered none other than Joe Taylor’s, K1JT, CQ! When I started out in ham radio as a Novice in January 1955, I often wondered if anyone was actually hearing me. The answer was usually “no” because I didn’t understand proper station design and operating procedure, and I was using a poor antenna. This situation resulted in pages of logged CQs and no answers. I like to compare that to what I can accomplish with JT9. For example, I used JT9 to contact Brendon, VK4HIA, in Australia. He was running 1 W and I was running 5 W. According to the WSJT-X display on my computer, that was a 9081 mile trip. I then checked the pskreporter website to see who else “heard” my signal; it turns out lots of folks did! I am having great success running 1-5 W, and I frequently look to see what stations on other continents have also copied my signal. This is a very different (and gratifying!) level of DXing fun! To provide a practical demonstration of the worldwide coverage of JT9, I conducted a test transmission from my shack in North Florida at about 5:30 PM EDT. I set my TS-590S transceiver to 1 W power output. This was fed to my vertical through about 70 feet of RG-8X. How much power arrived at the antenna? I don’t know, but it had to be less than 1 W. Using the pskreporter.info program I captured this map (see Figure 3) showing the worldwide reception of my 1 W transmission. To get started with JT9 you’ll need a transceiver able to run 20 W or less, a computer, a soundcard interface to connect the two and some free software. You can find all the instructions for setting up a JT9 station on the WSJT-X website. Read the WSJT-X User’s Guide first; don’t wait until you have problems. If you do have problems, you can get help at groups.yahoo.com/group/wsjtgroup/messages. When I first started using JT9 I found it a little tricky to get the computer’s clock to sync with WWV or another time standard. If you can’t get your computer to within a 1/2 second of correct WWV time, WSJT-X may not decode any signals. The User’s Guide can help. A second common problem is overdriving the audio. More is not better. I have found that if I set the audio drive at a point half way to where the ALC starts working, I will have a clean signal. To get 1 W, I can set my rig at the 5 W minimum point and dial down the SignaLink’s drive to 1 W on the antenna tuner meter. When operating low power you can get discouraged when you call stations and get no responses or responding stations lose you in the interference. With JT9 running 1 W, you might not be answered by the station you are calling, but using the pskreporter.info program, you can see that you have been heard by many others. This turns discouragement into excitement! This is a new mode for me and I’m loving every contact. My goal has been to tell you how great this mode is when you have a little pistol station. Even if you have a big gun station, why not try something completely different and see what you can do with 1 W? So why not spend some time on JT9 — Thanks, Joe. 1B. Glorioso, W1IS, “A Suspended Quarter Wave 40 Meter Wire Vertical Monopole,” QST, Aug 2011, pp 34-36.